The Kyosho Mini-Z is more than just an small RC car, it is a legendary story of innovation and evolution. Incredibly detailed, the Mini-Z with scale body, riding on an amazing chassis, brings electronics, engineering and performance to a level that is almost unbelievable! The Kyosho Mini-Z can be operated by beginners and experts alike. This is a great introduction to racing and the RC world, as well as a fantastic pursuit for an expert level racer looking for the next race win! The Mini-Z feels incredible as you drive and with a huge number of upgrades and performance enhancements the experience can become even more intense! Don’t let the small size fool you! 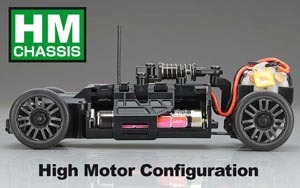 This model and body uses the High Mounted motor configuration. The MR-03 chassis heralds a new era in the world of the Mini-Z Racer. The objective first, was to develop a chassis that could provide better handling dynamics than the older MR-02 chassis and this peak performance chassis doesn't disappoint. It blows its predecessor away! Second, the chassis needed to be versatile so, that all the previous MR-015 and MR-02 series bodies would fit. This allows almost all of the bodies from all previous Mini Z racers to fit with ease. The MR-03 chassis is uncompromisingly designed for racing performance. It is considerably narrower than the MR-02's predecessor and has a much lower center of gravity. This results in significantly higher cornering speeds and very agile handling. The newly developed chassis front wheel alignment gives the maximum mechanical grip and perfect traction in all driving situations. The Mini-Z MR-03-Racers are equipped with the latest 2.4 GHz wireless technology. When you turn on the transmitter the entire frequency band is automatically scanned and selects a free channel. This eliminates the need to organize finding frequencies for drivers. A total of up to 40 models can be operated simultaneously with this new system and there are no crystals! The frequencies are generated by a PLL synthesizer. Along with the new 2.4GHz radio technology, all the electronics have been revised for the MR-03. The new processor runs faster and in conjunction with the Hi-Speed FETs gives the MR-03 ultra fast response to user inputs. The MR-03-Racer does not include the 2.4 GHz transmitter. The Kyosho Perfex KT-18 transmitter No. KYO82001 is not included with the MR-03 sets and must be purchased separately. Some of the new hi-tech features are included in the new electronics in the MR-03. The RA-22 2.4 GHz receiver control unit can use the optional DNW-107 piezo gyro to increase the stability of the car. The piezo-gyro detects movement of the vehicle about its vertical axis (skidding), long before they are visible to the human eye and controls it within a split second. In the front of the car sits a high-resolution digital servo, which receives the steering commands and translates them in a split second to the wheels. The new servo has a coreless servo motor which is durable and fast. The gear ratio in the servo is 94.41:1. The front wheels are independently fitted with spring-mounted, double wishbone suspension. The high-grip, low profile tires give the MR-03-Racer uncompromising traction. In conjunction with the extremely low center of gravity a breathtaking driving dynamic is achieved which, on models of this size has never been realized before. These precision designed cars drive and handle more like their much larger counterparts. The control board of MR-03-Racer comes equipped with an ICS interface. With a special USB cable and software, purchased separately (KYO82080), the chassis setup can be programmed by your computer. The setup data of the vehicle can be conveniently stored on your hard drive. The rear axle of the MR-03 chassis is based on proven MR-02 components. Through the spring loaded Powerpod, the chassis is very flexible and adapts to any road situation perfectly. The batteries are mounted so that the center of gravity is very low for improved handling. The Unbelievable paint finish is actually hand polished! One of the special features of the MR-03 is the amazing pre-finished body. After assembly and final quality control, the models are hand polished and brought to a perfect shine. The detail and finish is "Show quality" and deserves a place on display under glass. However, if you decide to run yours in the sun light, the MR-03-racer looks like a precious jewel! VCS (Variable Camber Suspension) – The upper control arms are connected to king-pins and knuckles with ball links and allow the camber angle to change with suspension stroke, just like a real car. Tire contact with the surface remains constant, even during chassis roll and suspension stroke from surface tracing. The newly developed digital steering servo uses a coreless motor that delivers quick steering response and sharp maneuverability that feels like its riding on rails. Also, the upper arm and one-piece cantilever provide ideal cushioned movement for the coil spring. In addition, the stainless steel king pin and wheel shaft deliver smooth movement for excellent running stability. Precision geometry settings eliminate toe in and toe out change during suspension stroke and produce a neutral steering feel. The innovative VCS (Variable Camber Suspension) represents a significant evolutionary step in the history of the MINI-Z. Digital Steering Servo - The powerful position retention and movement of the digital servo is enhanced with the adoption of a coreless motor that provides instantaneous pick up and stopping. In addition, the newly developed steering gear unit has 3 times the gear ratio of previous versions for greater power in holding it's position so it keeps it's line firmly in the face of kickbacks from the road surface and also delivers even more precise movement and response. Battery Layout - Same battery layout as the MR-02 chassis achieving a low center of gravity with a main chassis width equal to the narrow MR-015. Compatible With All ASC Bodies - The main chassis is compatible with all MINI-Z ASC, AutoScale bodies, ranging from MR-015, MR-02 and AWD. Pick and choose from any body in the Mini Z AutoScale body series; there are 100's of bodies to choose from. *Special motor case and differential gear assembly is required to fit some body styles. RA-22 2.4GHz RX TX Technology - Equipped with the new next generation RA-22 2.4GHz RC unit specially designed for the MR-03. Requires no frequency bands. Simply switch power ON and enjoy safe and stable control. SF 2.4GHz system automatically scans for open frequencies and promises safer and more secure control. Endless Adjustments - Coil springs in the front suspension can be easily replaced by removing the spring stopper with just two screws. Motor mount can be easily removed and replaced to suit whatever chassis configuration you want to run from a MM, RM, HM or LM type of mount. Power Train - Rear power train utilizes the previous models design, the MR-03 rear drive train is fully compatible with all the optional parts currently available for the MR-02. Technical data based on the chassis without a body! Since the chassis is variable in length, width and tire the data provided has some minimum and maximum values.